There’s not one particular facet of the Mazda3 that gives it such wide appeal. Yet the overall appeal is there, judging by the annual car sales. A year ago, there were 75,018 Mazda3s sold. Although a low number compared to some other years when 100,000 in sales was not unusual, it’s pretty clear that the Mazda3 is very popular among car shoppers. 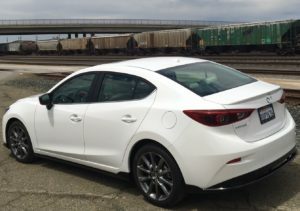 The 2018 Mazda3 performance is very solid – a 2.5-liter, four cylinder that produces 184 horsepower and 185 pound-feet of torque. Affordability continues to be a huge lure for the popular compact sedan, which ranges in price from approximately $19,200 to $25,800. The Mazda3 features an appealing look, is sporty for a compact, handles well, and has a smartly designed interior. A single test drive in the 2018 Mazda3 might convince folks who say they don’t care for compact vehicles to reconsider. This is a good automobile for a variety of reasons, most notably its blend of performance and efficiency. The compact class has a number of “stars” and the Mazda3 has been one of them since debuting in 2003. It shares the spotlight with some other notables, like the Hyundai Elantra, Honda Civic, Ford Focus, and Toyota Corolla. The Mazda3 receives just a few minor updates for 2018. The most notable change is the 2.5-liter engine is now standard on the Touring trim. If you enjoy shifting gears in the manual transmission, you will love the Mazda3 because it really adds fun to the driving experience. There’s a fun factor to the automatic transmission as well. The responsive Mazda3 performance is very solid – a 2.5-liter, four cylinder that produces 184 horsepower and 185 pound-feet of torque. The engine is quick, smooth and delivers good acceleration. The base model comes with a 2.0-liter, inline-4 with 155 horsepower and 150 pound-feet of torque. It’s not as quick as the larger engine, going from 0-60 mph in roughly 8.3 seconds. Several years ago, the Japanese auto manufacturer wanted to provide better gas mileage and succeeded with its “Skyactiv” powertrain. The mileage is practically identical in both Mazda3 models, ranging from 27-37 mpg. The Mazda3 also receives solid marks for the way it performs. The engaging compact accelerates quickly and handles with good precision when navigating tight turns, providing the driver with a high level of confidence. The Mazda3 has a well-designed cockpit that is better than most compacts. It features an in-dash, 7-inch touch-screen monitor that is controlled by a center console knob. Although everything is within reach for whoever is handling the monitor, I found the audio system setup more confusing than it needs to be. The front seats provide good support, comfort and adequate head and leg room for a compact car. The rear seats are not as gracious with space, especially leg room. But two adults can still reside in the Mazda3 with a level of comfort. The sedan has 12.4 cubic-feet of space in the trunk, while the hatchback is much larger at 20.2 cubic-feet. When folded down, the space enlarges to just over 47.1 cubic-feet. The Mazda3 continues to be rated among the top compact cars and remains a great buy for multiple reasons.